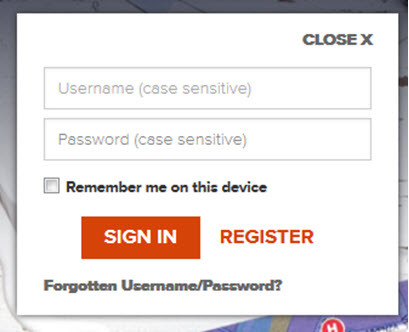 From the rci.com homepage, move your cursor over the SIGN IN or REGISTER area, and click on “Register” button. 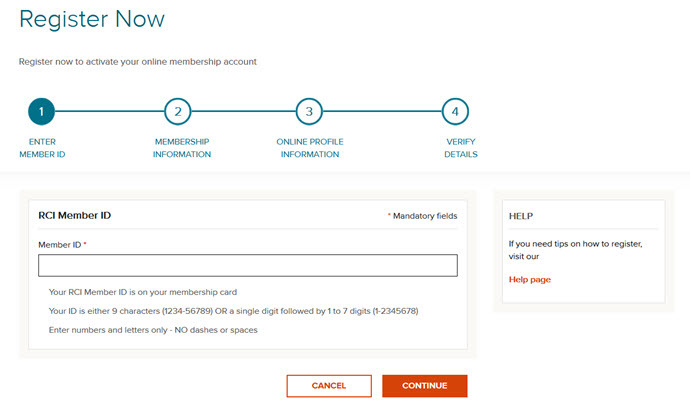 Step 1: From the “Register Now” page, first enter your Member ID in the space provided. If you are an RCI Weeks Member, your RCI Member ID will either be a series of nine alpha-numeric characters (e.g., 1234-56789), OR if you are a RCI Points member it will be a single digit followed by one to seven digits (e.g., 1-2345678). When entering your RCI Membership ID, please use letters and/or numbers only. Make sure not to include any dashes or spaces i.e. 12345678, then click “Continue”. 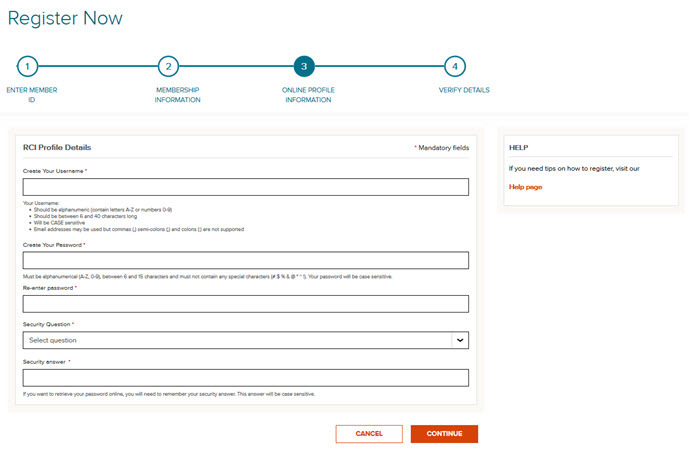 Step 2: The Member ID you entered in Step 1 will automatically be populated for you. Now enter your Last Name in the field provided. Then enter your email address in the field below. We will need verify that this is correct, so please enter it again in the field provided. Finally select your country of residence from the drop down menu. This should be the country you lived in when you registered with us, and click continue. Step 3: You now need to create your personal login details. First enter a unique username, up to 15 characters long. If the username you have chosen is already taken, we will advise you and you will need to select another. The password is case sensitive, so if you are using upper case characters or lower case characters you will need to enter it exactly the same each time you login. Please do not use any special characters in your selected password i.e. $%&@”. Next create a password that is between 6 and 15 characters long, remembering not to use any special characters and that the password is also case sensitive. When chosen, we need to verify your password is correct so please enter it again in the field provided. Now provide your answer to your chosen question. Remember you will need to remember your answer if you wish to retrieve your password online in the future. 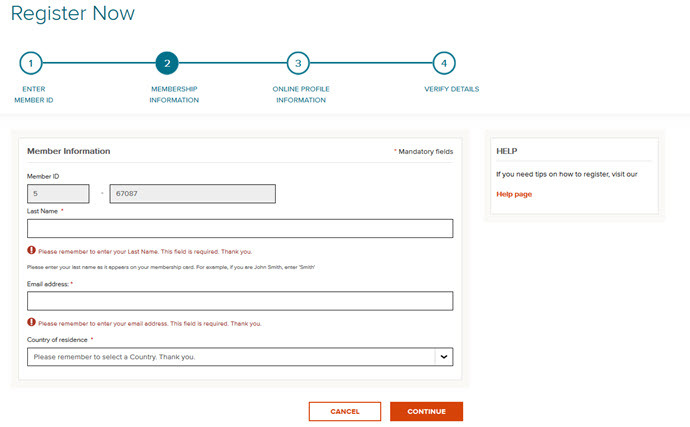 Step 4: You now need to check the tick box if you agree to RCI’s Membership Terms and Conditions. You will now receive an email confirming that you have successfully registered account. If you registered for your online account with the SAME email address that we have on file for you, you can go and login straight away. If you have registered with a different email address, we will send you an activation email immediately. You will need to click on the activation link so we can confirm that this is your email address. If you don’t receive an email within a few seconds, please check your junk mail box. Once you have clicked on the activation link you will automatically be logged into rci.com. 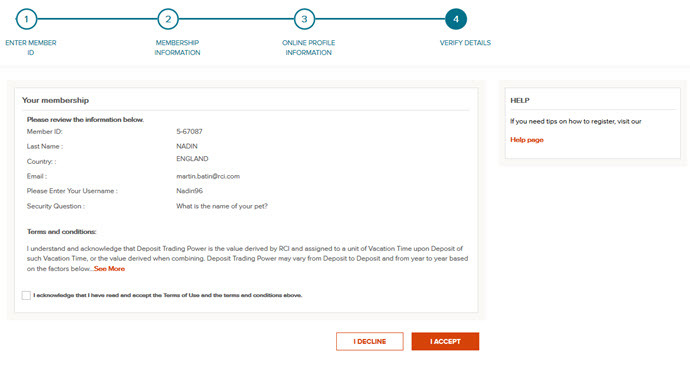 Finally you will receive a Welcome email, confirming that you have successfully registered on rci.com.